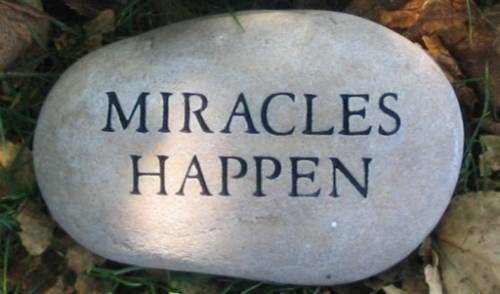 Tis the season of celebrating miracles in the Holy Land. Chanukah commemorates one of the best known sagas of the Jewish people …. but still another miracle occurred just this week when the zio New York Times actually admitted to its readers that there is a Palestine. 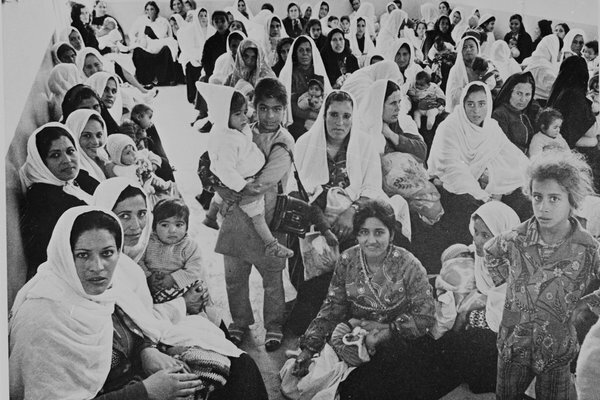 Palestinian refugees arriving in east Jordan in 1968. JERUSALEM — There is one picture of Palestinian children studying around a small table by the dim light of gas lamps in the Beach Camp in Gaza, and another of children peeking over a sandy dune, with rows of small, uniform shacks of a desolate refugee camp in the background. In a third, a family walks across the Allenby Bridge, the father carrying two bulging suitcases, a young son clutching a white ball, heading east over the Jordan River. These are a few of the black and white images, many of them powerful and haunting, that will eventually constitute a digital archive compiled by the United Nations Relief and Works Agency, the first part of which was unveiled Thursday at a gallery in the Old City here. Together, they capture the Palestinian refugee experience from the 1948 war onward, giving form to a seminal chapter in Palestinian history, identity and collective memory. For decades, about half a million negatives, prints, slides and various forms of film footage have been hidden away in the archive of UNRWA, the organization that assists Palestinian refugees. Stored in buildings in Gaza and Amman, Jordan, the materials had begun to grow moldy. So officials started a preservation mission, digitizing the archive, which also documents the work of the agency. The exhibit that opened Thursday, called “The Long Journey,” will soon go on tour to large cities in the West Bank, Gaza, Jordan, Lebanon and possibly Syria, and will also be shown at cultural and political centers in Europe and North America. The images will also be made accessible to the general public on a special website. 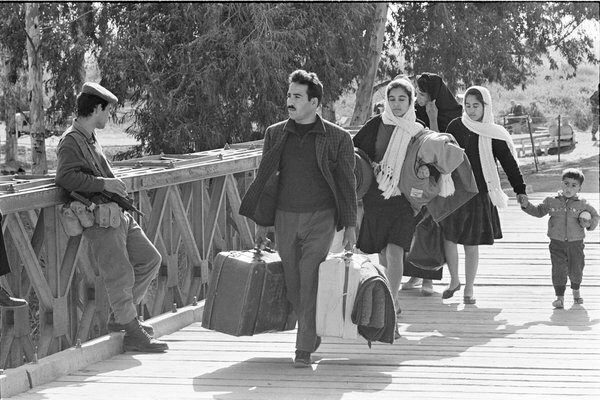 Palestinians refer to the events of 1948 as al-Nakba, Arabic for “the catastrophe.” About 700,000 Arabs fled or were expelled from their homes during the Arab-Israeli war over the foundation of Israel. 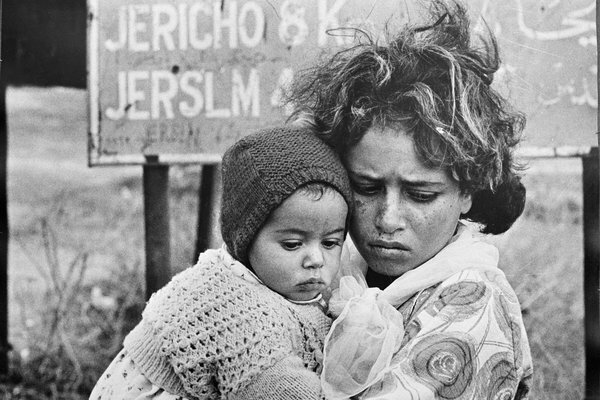 Hundreds of thousands of Palestinians were later displaced by the Arab-Israeli war of 1967, some becoming refugees twice over. Tens of thousands have recently been displaced again, reliving the trauma, because of the civil war raging in Syria. But the refugee issue remains one of the most delicate and complex elements of the Israeli-Palestinian conflict, at the core of the two sides’ clashing historical narratives. So it was perhaps inevitable that some Israelis would view the new memorialization of the refugee experience through a prism of politics and contention. “When was the last time that any United Nations agency raised so much money and invested so much effort in organizing and circulating around the world the documentation of a specific plight like that of the Palestinian refugees? Never,” said Yigal Palmor, the spokesman for Israel’s Foreign Ministry. “This only emphasizes the strident anomaly of the dedication of a disproportionate part of the United Nations budget, staff, time and resources to the Palestinian issue exclusively at the expense of, and to the detriment of, all other similar issues,” he added. Israel vehemently rejects the Palestinian demand for a right of return for the refugees who, by the agency’s count, now number around five million, including the descendants. It says that any mass influx would spell the end of Israel as a predominantly Jewish state. 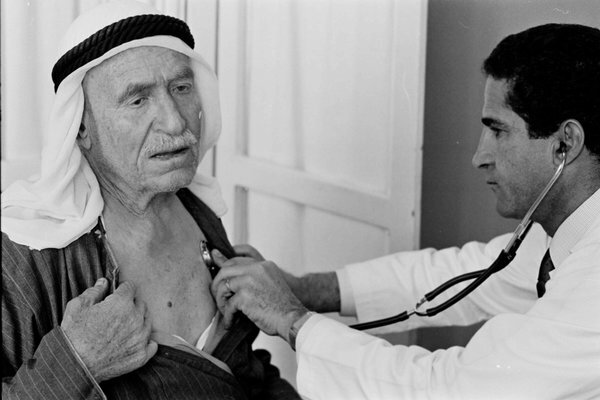 Israelis often blame the very existence of the agency — which was set up in 1949 to deal with the Palestinian refugees and which provides relief, education and health services — for prolonging their sense of impermanence. The world’s other refugees are handled by a single agency that was set up later, the United Nations High Commissioner for Refugees. Christopher Gunness, an agency spokesman, said its mandate was to help the refugees and to advocate for their rights until all sides to the conflict negotiated a just and durable solution. Mr. Gunness added that the Palestinian refugees would have the same rights and status under any United Nations agency. Funding for the project, about $1 million so far, has come from the Danish and French governments and from the Palestinian private sector. It comes as the agency is struggling with a budget deficit and appealing for emergency funds to cover its needs in the West Bank and Gaza and to contend with the crisis in Syria. Mr. Gunness said that the money raised for the archive project had nothing to do with the budgets for staff salaries or refugee welfare. 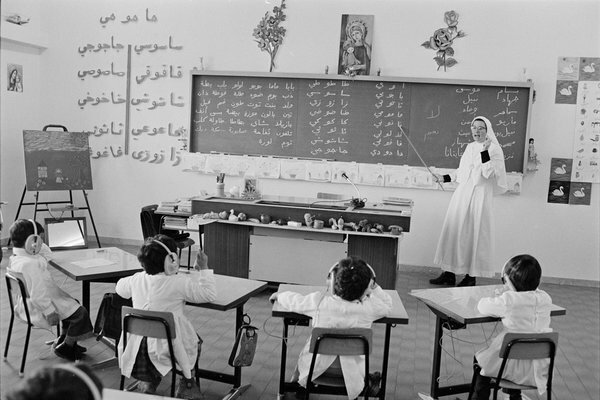 The exhibit captures the Palestinian refugee experience since 1948. 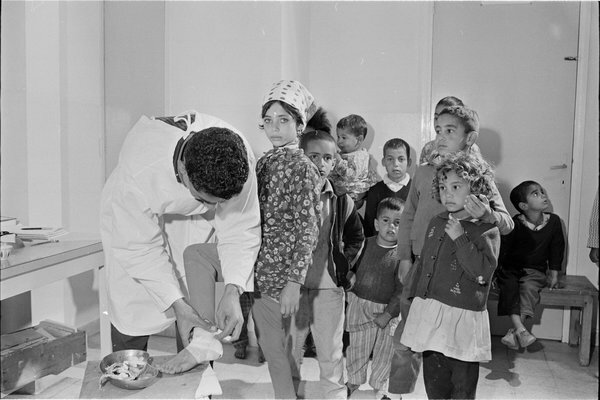 Children in a camp in east Jordan received vaccinations. 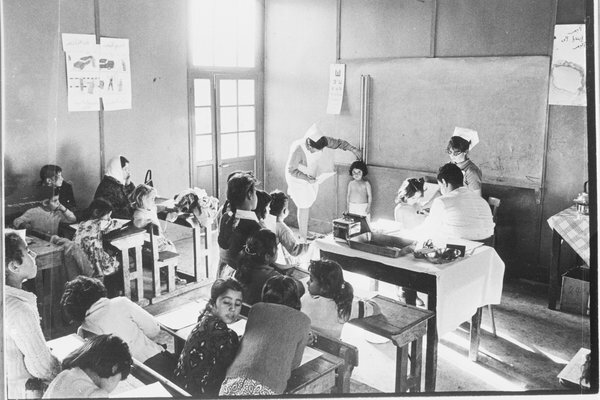 A medical team examined children near Amman, Jordan. 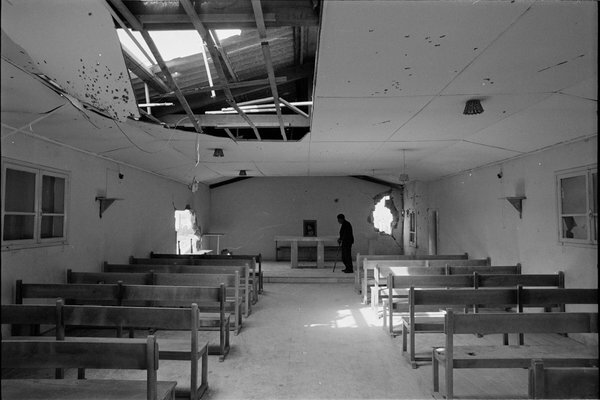 Hundreds of thousands were displaced during the 1967 war. Children being taught at a refugee camp in east Jordan. The exhibition will appear in cities across the Middle East. 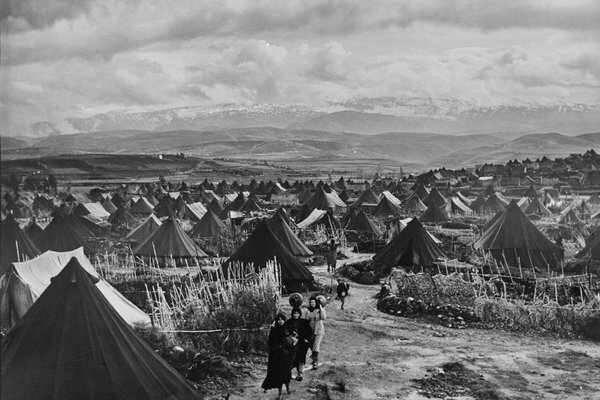 Nahr el Bared camp, near Lebanon, shown in 1952. A drop at a time will a bucket fill…may this article be the first drop to fill the bucket of knowledge about the Palestinian people.